Also I got a commission this past week for a doggie Xmas stocking. Hilarious! Maybe I should make some more if I have time. 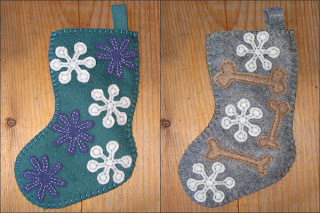 The doggie stocking is on the right with the bones. I'm also making more stockings in preparation for the big baking event with my Mom this week. The stockings have been a big hit and only cost about $1 in materials! I've decided to try and make more out of recycled material. I made these stockings out of the wool scarf I bought for $2 awhile ago. It's a gorgeous lush charcoal grey with red on the other side. I was able to use the side of the scarf for the top of the stocking. I think it adds a nice touch. 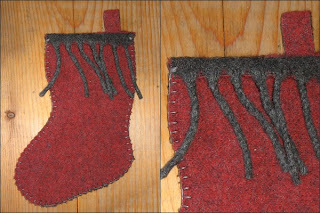 I created a second stocking using the fringe of the scarf. I'm not sure if this one worked out as well. These were quick and dirty stockings to make since I cut out the front and back then did a buttonhole stitch along the edges. Pretty easy and they look kewl. 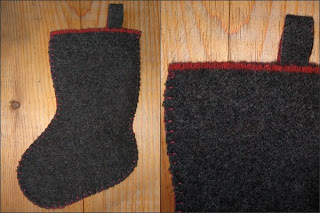 By the way, this is the stocking template I'm using although I can't remember how much I enlarged it. Here's my Mom's recipe for shortbread - it's very yummy! I made more this week for my stockings. I have small bite-size cut outs that are perfect for packing into the stockings. 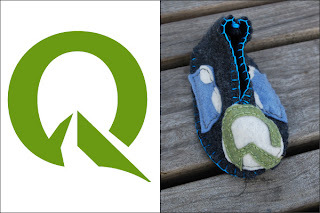 Normally I'm not into branding babies but I made these for someone who works at Quest University Canada in Squamish. I included the logo plus some mountains along the side. 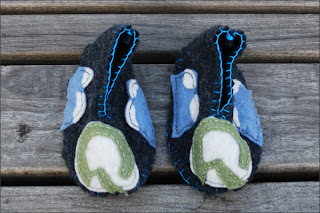 They liked the booties and want a branded onesies so I said I could help them out! You really ARE great at this crafting thing, Denise! These stockings are swoony. I love them.